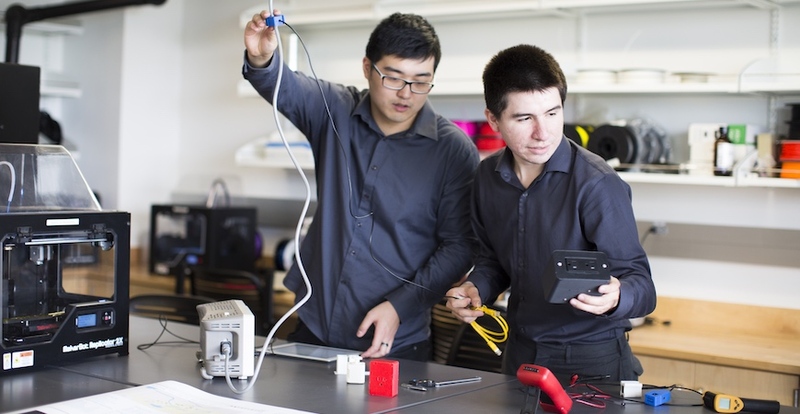 UC Merced alumni Yi Lu ('15) and Agustin Roldan ('15) founded Sweep Energy with help from the university's Venture Lab and its free legal services for local startups. The following article appeared in the November 2017 issue of Merced Monthly, an e-newsletter for the UC Merced campus community and friends. To subscribe, click here. Early-stage startups often find themselves in a difficult bind. They need legal counsel to help them form business entities, understand tax liabilities, license inventions and draft terms of service. But many startups can’t afford lawyers. That’s where UC Merced’s Venture Lab can help. “Many companies suffer from legal pitfalls that are easy to navigate with the right guidance,” said alumna and Venture Lab Program Manager Cara Baird ('15). “Unfortunately, traditional legal assistance is not cost-effective for budding startups." Since launching in 2015, the Venture Lab has provided entrepreneurs with a variety of services to help them begin new enterprises. But one theme consistently reemerged as more and more startups joined the Venture Lab: the need for legal counsel. Professor William Kell and Deputy Attorney Kevin Xu of UC Berkeley Law School run the New Business Practicum (NBP), a legal clinic that serves both startups and law students. Students provide free legal advice to budding entrepreneurs; in the process, they gain practical experience dealing with real-world clients. The Venture Lab teamed with NBP in October 2015 to provide pro bono legal consultation services to Venture Lab affiliates. It quickly became the Venture Lab’s most in-demand resource. And it helped launch some of the incubator’s most promising startups. Michael Simon, now a fourth-year human biology major, founded Eirene Technologies in May 2016 after the Venture Lab and NBP helped him license technology developed by physics Professor Michael Scheibner. As President and CEO of Eirene Technologies, Simon is commercializing Scheibner’s technology for use in contraband detection. It’s technology that both the TSA and U.S. Customs and Border Protection have expressed interest in. But Eirene might never have gotten off the ground without the Venture Lab’s free legal services. Many companies suffer from legal pitfalls that are easy to navigate with the right guidance. Unfortunately, traditional legal assistance is not cost-effective for budding startups. Xu, who served as Simon’s main counsel, also helped Simon draft company formation documents, company bylaws and shareholder agreements. Agustin Roldan ('15) tells a similar story. Roldan founded Sweep Energy after graduating from UC Merced. Sweep uses predictive analytics to help companies monitor industrial motors and prevent equipment failure before it interrupts production. Roldan joined the Venture Lab in October of that year and began utilizing the legal services almost immediately. Like Simon, Roldan worked with Xu from the very start. It’s a partnership they maintain to this day, ensuring that the legal advice Roldan receives comes from a source familiar with Sweep. The Venture Lab’s legal services aren’t just for UC Merced affiliates. “First Fridays” are free workshops — held on the first Friday of each month — open to the public, where anyone in need of business-related legal advice can get the guidance they seek.